Sometimes you get what you want, even in science. But everything comes at a price. In case of Martin Chalfie, he wanted to use some of his wife’s unpublished research results for his upcoming Science paper. His wife, Columbia professor Tulle Hazelrigg, agreed but made a humorous list of three things her husband had to do in return: “1. You make coffee each Saturday morning for the next two months, ready by 08:30 a.m. 2. You prepare a special french dinner at a time of your choosing. 3. You empty the garbage nightly for the next month.” Chalfie showed this list in his Nobel lecture (slide no. 17). We don’t know how well Martin Chalfie met these requirements, but we do know that he was allowed to use his wife’s findings for his 1994 article “Green fluorescent protein as a marker for gene expression”, which is among the 20 most-cited papers in the field of molecular biology and genetics. In 2008, Martin Chalfie, together with Osamu Shimomura and Roger Y. Tsien, were awarded the Nobel Prize in Chemistry for their discovery and development of GFP. Today, GFP is used as a reporter gene, it tells scientists if a specific gene has been expressed, as a biosensor and biomarker. Its advent has also helped super-resolution microscopy considerably. 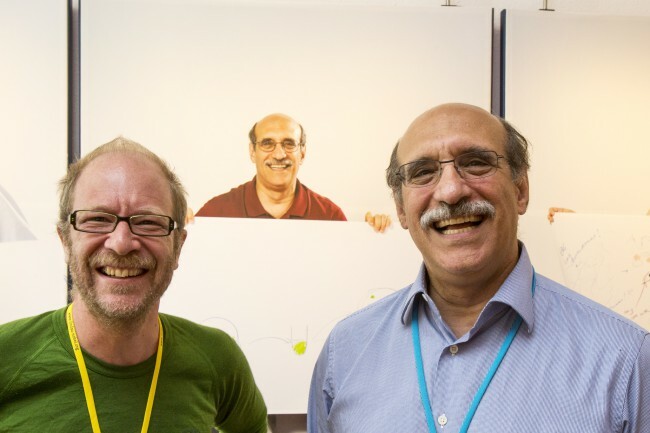 It was inspiring to hear Martin Chalfie’s lecture at this year’s Lindau Nobel Laureate Meeting (see screen window below). He talked about his favorite model organism C. elegans, but not about GFPs. In recent years, Chalfie and his research group have been studying the animal’s sense of touch. They already came up with over 500 mutations in the 17 genes that make the six neurons that constitute the animal’s sense of touch. “You might ask yourself,” Chalfie said with a smile, “what sophisticated instrument we use to sense touch in a one millimeter animal?” Well, it’s a toothpick with a glued-on eyebrow hair, because these hairs usually are uncut and thus have tapered endings. An eyelash would work as well, but tearing out an eyelash can be painful (for the human, not the worm). Working with touch-insensitive mutants, Chalfie’s group has discovered that five of these 17 genes are responsible for cell development, twelve for cell function. One example: the two genes MEC-4 and MEC-10 are responsible for the formation of a membrane channel that opens when mechanically stimulated – at this moment, the cell is able to sense “touch”. With the help of this channel, the mechanical stimulus is transformed into electro-chemical activity. This is how a functioning neural circuitry works to provide a sense of touch. However, a scientist’s mind never rests. Studying the formation of senses is one thing, but all senses can be modified. “When you go from a dark room to a bright room – your eyes adapt,” Chalfie explains in his Lindau lecture. Next he surprised everybody present by saying: “All of you, until I say the word, will NOT be feeling your clothes that you’re wearing, because you’ve habituated to them. But once I say that, you start to squirm and of course you feel that you are wearing clothes – and you’re relieved.” Laughter erupts. “This is called habituation reversal.” Honestly, I never saw so many people in one room trying desperately NOT to squirm. But how does this sense modification work on a molecular basis? In the past Martin Chalfie had a “brilliant idea”: they had worked with many touch-insensitive mutants, but never found super-sensitive ones. To find those, he bought many car loudspeakers to expose the worms in petri dishes to constant low vibrations, trying to determine their sensitivity threshold. The result: “It did not work at all.” Now all these loudspeakers were sitting around in the lab… One PhD student, Xiaoyin Chen, decided to use them for something else entirely: he exposed the worms for hours to a loud 50 Hertz buzz. (Don’t try this at home.) At first, Chen found the worms to habituate. After a while though, the habituation was reversed, the animals got sensitive to the sound again – but only in the front. If a petri dish with healthy worms is tapped mechanically, they always move backwards, it’s their natural escape reflex (if their frontal neural circuitry is downgraded, they go forwards). Since C. elegans will probably never meet so many car loudspeakers in the wild, why do these animals exhibit such complicated patterns? The only repetitive sound they might hear over hours in the wild is rain, and “the big predator of these worms is a fungus with a lasso that clamps on them. So after a rainstorm, a protective mechanism would be: be really sensitive and get yourself out of this,” Chalfie explained. Chen also worked out the molecular mechanisms behind this pattern and found that different insulins play a crucial role in the habituation mechanism. Chalfie concludes: “The nervous system that we thought we knew actually works through all these hormone systems. I call this the shadow nervous system.” It’s great fun to hear Martin Chalfie talk. Obviously, he is fascinated by his work and the many mysteries he couldn’t solve yet: “What is this shadow nervous system? How does it map on to the circuitry we know, from the neurons, the chemicals and electrical synapses? Are there other types of modulation?” And, “how is habituation maintained and rapidly reversed? Do you remember when I said ‘clothes’, how quickly you felt that you had clothes on?” So apparently, habituation can be reversed instantly. That leads us to the ultimate question: “How does the sense of touch work in humans?” At the end of his lecture, Chalfie points out possible future applications of this research. First he explains how the first symptoms of type II diabetes are often numbness in fingers and toes, diabetic neuropathy being the no. 1 cause for amputations worldwide. Knowing that touch habituation is modulated via insulins may be of help to treat these patients in the future. 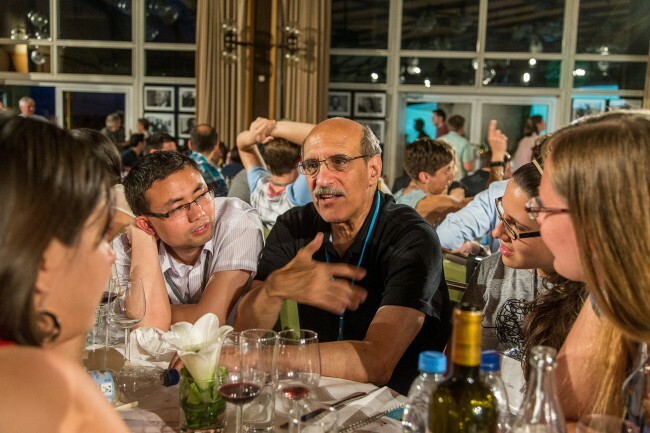 Martin Chalfie is a regular participant of the Lindau Nobel Laureate Meetings, he attended five times and gave a lecture at each of these meetings. Read his essay on mulitdisciplinarity for the 65th Lindau Meeting; you can also visit his “Nobel Lab 360°” here.